Ukrainian rebel in Donetsk. Credit: Moscow Times. If you scroll through global news sites like BBC or Al Jazeera, you’re accustomed to seeing young men gearing up for combat. But there’s also a surprising number of women fighting in conflict zones, and it’s an oft-overlooked aspect of modern warfare. In fact, in certain regions, the presence of female soldiering is not even all that new. Jessica Trisko Darden delves into this subject in a new book, Insurgent Women: Female Combatants in Civil Wars. Familiar concerns about armed men “killing women and children” civilians are powerful, but they don’t always apply. It’s often women who are fighting and dying for a nation or a cause. At American University, Trisko Darden is an assistant professor in the School of International Service. She’s active in Washington policy discussions and is now an inaugural Jeane Kirkpatrick Fellow at the American Enterprise Institute. Trisko Darden co-authored Insurgent Women—due out in February—with Alexis Henshaw of Troy University and Ora Szekely of Clark University. The book is broken into three parts, based on three case studies of women fighting in civil wars. Trisko Darden focuses on female fighters in Ukraine, while Henshaw examines Colombia, and Szekely writes about Kurdish militant groups and the broader Middle East. 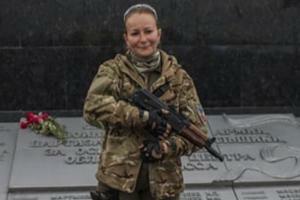 Ukraine has a long tradition of women participating in insurgency. Dating back to the 1920s and 1930s, women were involved in independence campaigns against Poland, Nazi Germany, and eventually the Soviet Union. Trisko Darden studied contemporary participants on both sides of the civil war. There are women fighters with the Ukrainian armed forces, the oligarch-funded militias aligned with the military, and the Russian-backed, pro-separatist groups in the Donbass. She says female fighters in armed groups affiliated with the Ukrainian military tend to be younger, and grew up in post-Soviet Ukraine. Women in pro-Russian rebel groups—with stronger connections to Russia and its language—tend to be older, have children, and own property. Still, there are noticeable differences between male and female combat experiences. In the book, one rebel commander memorably compliments a female fighter and former kindergarten secretary. A woman’s gender identity doesn’t have to be hidden, and it’s sometimes even accentuated. For instance, pro-Russian rebels organized a beauty pageant for their female fighters. Rebel fighting can also be part of women’s empowerment and liberation. And they’re facing risk factors not shared by their male counterparts. Some female Kurdish fighters sign up to elude forced marriages, and many Colombian women joined the FARC guerrilla movement to escape domestic violence. Women were present in the Kurdistan Workers’ Party (PKK) at its founding, and with more female commanders, this enabled the recruitment of more women soldiers. “They also have a tendency to establish women’s rights platforms, and these kinds of women’s rights platforms have expanded into LGBTQ platforms as well. So it’s become part of a broader project of social emancipation in what are rather conservative cultures,” she says. So, why are women fighting in these civil wars? It’s often noble values of patriotism, with a desire to protect their families and better their communities. But Trisko Darden says there isn’t one easy explanation. Research has shown women traveling long distances to fight in military battles. Yet in areas suffering from internal strife, it’s sometimes about stepping forward when no one else will.